Today we have a fun (and adorable) little ice cream card created by our talented guest designer, Rebecca Yahrling (see her Flickr gallery here). I love those super cute ice cream cones and the fact that she created a shape card with matching envelope! 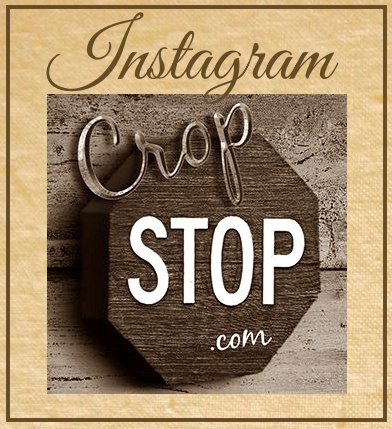 "First, I want to say thank you so much to Esther and Crop Stop for having me as a guest designer. It's such a huge honor to me. And I hope my card makes you smile today! I started by die cutting five ice cream cones (Sizzix); the cones from kraft cs and the ice cream from three colors of cs (2 layers for dimension). I embossed the ice cream with the polka dot ef (Cuttlebug) and the cones with the diamond pattern ef (Darice). I adhered them all together with a ZIG glue pen. I used a brown marker (Sakura) to color in the polka dots to resemble chocolate chips. I then added Ranger glossy accents to each and set them aside to dry (maybe an hour). I then cut a 4.75" square white card base. I used MCT scallop frames to cut the largest from patterned paper (Echo Park) and the 2nd largest from aqua cs. I adhered the largest to the card base. I wrapped some AC gold & white twine around the smaller frame as shown, securing in the back with Scotch tape. I then adhered this panel to the card with double sided tape. I die cut the sentiment in two colors of cs and adhered (ZIG) together, offsetting a bit. I added this to the bottom center of the card using the ZIG pen; adding a pink gem for the dot of the 'i'. I then adhered the ice cream cones, popping up the middle cone. 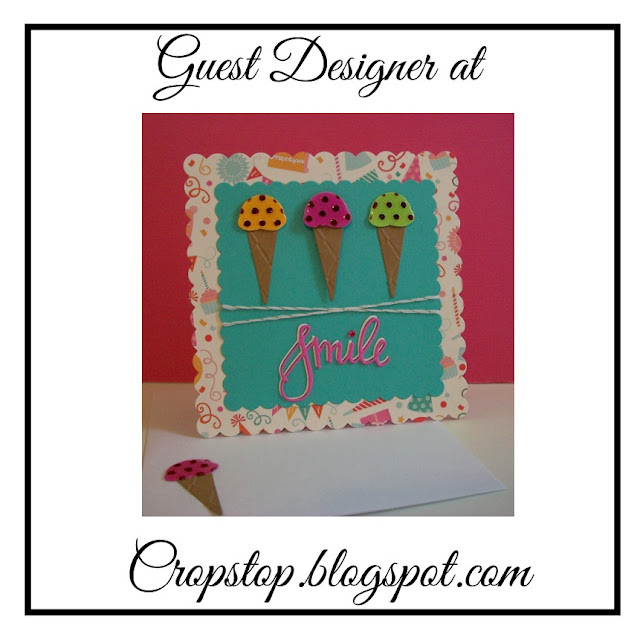 I also added a cone to the front of the envelope and decorated the inside of the card by adding a square of pink cs, another cone and a die cut strip 'Happy Birthday' in white." Now it's your turn -- Stop by our CURRENT LINK PARTY and showoff any project that includes a product or two from one of the companies Cropstop carries in the store.